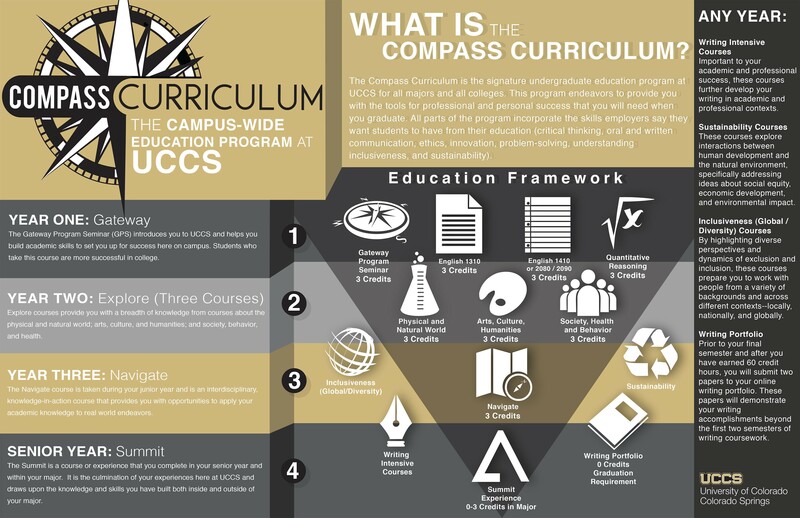 The Compass Curriculum is UCCS’s unique approach to general education. Students in every college will take courses designed to help them learn to Evaluate and Create, Know and Explore, and Act and Interact, the three major goals the faculty approved for general education for the entire campus. The goals of the Compass Curriculum focus on three interrelated areas of learning, all of which are essential to an undergraduate education. Through the Compass Curriculum, students will develop competencies in each area and the ability to integrate these competencies as a foundation for lifelong learning. Students complete one course in each of the three areas of knowledge identified in the Know and Explore goal. Some majors may designate specific courses students in that major must use to fulfill one or more of these requirements. This course integrates and applies learning from multiple disciplines. Navigate courses may be interdisciplinary or an upper-division course in a major. Some majors may designate specific courses students in that major must use to fulfill this requirement. Each major has designated a specific course, project or experience within the major that will assist students in integrating what they have learned in the major with the goals of the Compass Curriculum. Students will submit samples of work they have completed for other courses at least one full semester prior to graduation to demonstrate they have achieved proficiency in written communication. There are additional requirements associated with the Compass Curriculum that may not require taking any additional courses, depending on how the student chooses to fulfill them. Courses that fulfill these requirements may be in any of the categories above, in the major or count as electives. Some majors may designate specific courses students in that major must use to fulfill these requirements. UCCS applies transfer courses to fulfill Compass Curriculum requirements to the extent possible. Students who have fulfilled all lower-division general education requirements at any public institution in Colorado, including gtPathways, are deemed to have fulfilled the Gateway and Explore requirements from the Compass Curriculum. These students will still be required to complete the Navigate course and their major’s Summit course, as well as the upper-division writing-intensive course. They may also need to take a second writing-intensive course and courses that fulfill the Inclusiveness and Sustainability requirements if they do not have comparable courses in transfer. Please note that each of the colleges, and some individual majors, have additional general education and graduation requirements beyond the Compass Curriculum. Students with more than 30 credits in transfer will have the Gateway Program Seminar requirement waived. Transfer students should work closely with transfer advising to insure the most effective articulation between the student’s transfer work and the Compass Curriculum. For more information, please visit the Compass Curriculum website https://www.uccs.edu/compasscurriculum/.